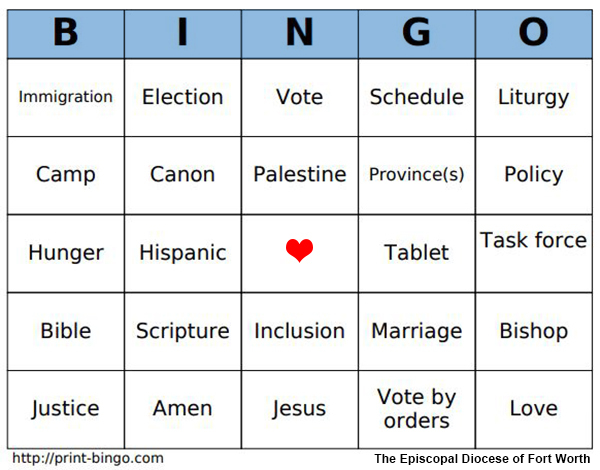 Call out “Bingo!” and amaze your house or committee meeting! Drop by the Episcopal Diocese of Fort Worth’s table in the House of Deputies (Table J7, right side) to say howdy and snag a card. Or print cards here (PDF: 1.7 MB, 500 pages), and be sure to use print settings to print a small number of our 500 pages. Words must be spoken, not read. What is The Episcopal Church’s General Convention? How can I get connected to General Convention information? Meet the Diocese of Fort Worth Depuation! Social Media & Website Coordinator at the Episcopal Diocese of Fort Worth. Photographer. Contributor to various church communications efforts, for parish and diocese. Mom, wife, Über-volunteer. Sprinkled lightly with geek.